I am a teacher who was using my school email for a parent account on Splash Math. How do I delete/change my old account so that I can create an account on Splash Math Classroom Edition? Please email us at help@splashmath.com and we will disable your previous account so that you can create a new account on Splash Math Classroom Edition. Option 2: I want to keep my previous account for my family and want to create a new teacher account for my classroom. 2. From Parent Dashboard page, go to "Edit Profile". 4. 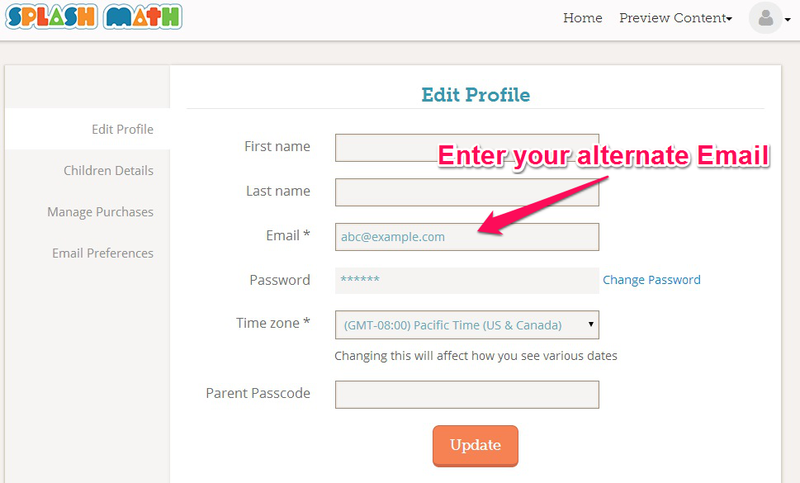 Click on "Update" at the bottom of the page to update your email address. You will receive a confirmation email on your new email address to verify it. Go to your mailbox and click on the link provided in the confirmation email to confirm your new email address. Once this is done, your parent account will be associated with your new email address. If you don’t receive an email, please make sure that you check your spam folder as well. Please add support@splashmath.com in your address book so as to make sure you receive all emails from us. 5. You are all set now to create a new teacher account on Splash Math Classroom Edition. Please click here or visit www.splashmath.com/teachers/register and create a new teacher account with your school email. How do I enroll my class in Splash Math? What kind of reports can I see in Splash Math?